High Quality Content by WIKIPEDIA articles! 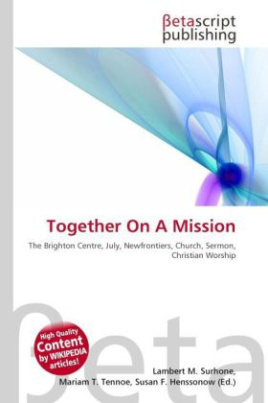 Together On A Mission is an annual conference held at The Brighton Centre, Brighton in July each year.Organised by the Newfrontiers network of churches, the 4 day conference involves teaching and worship. It is aimed at primarily at leaders, but welcomes students and people in their 20s. Each year, 5000 delegates from 50 nations attend the conference.Newfrontiers (previously New Frontiers International) is a neocharismatic apostolic network of evangelical, charismatic churches founded by Terry Virgo. It forms part of the British New Church Movement, which began in the late 50s and 60s combining features of Pentecostalism with British evangelicalism. Other streams of the British New Church Movement with which it shares some features include Together, Ministries Without Borders, and Life-Links. Groups like Pioneer, Ichthus Christian Fellowship and Vineyard are more distantly related. Newfrontiers is rapidly growing and claims to have 600 churches in forty nations worldwide.